On November 8, 2018, the Camp Fire started in Northern California. The fire eventually went on to become the deadliest and most destructive wildfire in California history, claiming 85 lives and destroying more than 18,800 structures, decimating the town of Paradise. It eclipsed the Tubbs Fire which, only a year earlier, had claimed 22 lives and destroyed more than 5,500 structures in California's Napa and Sonoma counties. These fires grabbed headlines. News outlets began to raise questions about whether land development decisions are making communities more susceptible to wildfire and to call out the rapid growth of the wildland-urban interface — the WUI — as contributing to more destructive wildfires. The WUI is any developed area where natural and cultivated vegetation (wildland fuels) and buildings or infrastructure (built fuels) meet and allow for the ignition and spread of fire. This intersection of human development and natural vegetation is where wildfires have the greatest potential to devastate a community, bringing injuries and deaths, damage to structures and infrastructure, and loss of ecosystem services. Every state across the country has a WUI. One-third of all U.S. homes are located in the WUI — and the number is climbing, intensifying wildfire risk for those communities. 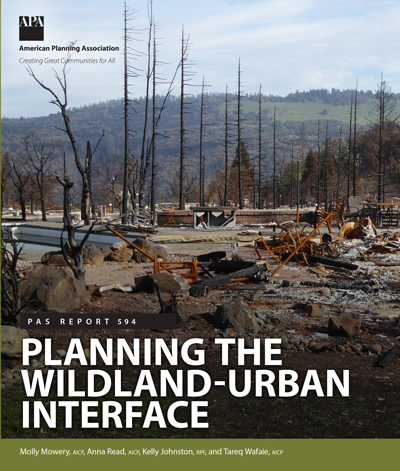 Planning the Wildland-Urban Interface, a new report from APA's Planning Advisory Service, explores the issue of how land-use decisions intersect with wildfire and provides practical guidance for planners working to address WUI challenges. The project that produced this report was funded in part by the USDA Forest Service, with technical and financial assistance from state and private forestry programs. It is available free to all for download. The report focuses on a comprehensive approach for planners working in communities across the country to respond to the growing challenges posed by wildfires. It begins with a primer on wildfire for planners, then introduces the concept of the WUI and builds a basic understanding of wildfire science and wildfire hazard. Then it provides a detailed look at how planners can address the WUI through plans and zoning regulations. While many factors — including our desire to live near forests, grasslands, and other wildlands — may make the existence of the WUI inevitable, planners and other stakeholders can take actions to help reduce wildfire hazard and mitigate consequences to the built environment. Join us at APA’s National Planning Conference in San Francisco on Tuesday, April 16, at 10:15 a.m. in Room 2002 for The Wildland-Urban Interface session to learn more. Then stop by the Meet the APA Editors and Authors events at the Publications Satellite on Saturday, April 13, from 1:30 to 2:30 p.m., and again on Sunday, April 14, from 3 to 4 p.m., to talk with the PAS Report authors — Molly Mowery, AICP, Anna Read, AICP, Kelly Johnston, RPF, and Tareq Wafaie, AICP — in person. Top image: Cabins burning during the Black Bear Cub Fire in Sevier County, Tennessee. Photo courtesy Tennessee Division of Forestry. Anna Read, AICP, and Molly Mowery, AICP, are two of the coauthors of PAS Report 594, Planning for the Wildland-Urban Interface. Read is a planner and researcher. Mowery is founder of the consulting practice Wildfire Planning International.